In 2006, when we made it clear that we would not give up our autonomy to the NGOs and walked out of a meeting at the Centre for Civil Society (CCS) at UKZN, some NGO workers, such as Mondli Hlatswayo, rushed to call us criminals on emails and in the press. Cape Town – Rioters ran through the smoke carrying cases of Coca-Cola after looting a wholesaler in Marikana, Philippi, on Friday morning as the area once again flared into violence while evictions were under way. 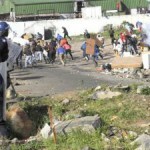 At the time of publication, running battles raged across several square kilometres as police clashed with angry residents. Khayelitsha, Cape Town, 17 September 2005 – Decent Housing For All – Now! The mass rally to demand housing for all that kicked off on the 17 September revealed mainly two things: the amount of anger and frustration over present housing policies, and the need to seriously start planning a concrete way forward. Cape Town, South Africa: No land! No house! No vote! South Africa: Victory for Campaign as Delft South evictions (ZA) and auctions stopped!